I think it was Horticultural Crisis 4168 that caused me to dig up Chrysanthemum ‘Mary Stoker’. 4168 was one of the Big Ones, when I realized that voles had destroyed a third of the Long Border and something needed to be done. Replanting with vole food seemed impractical, so I dug up the chrysanthemum, determined to rid myself of water hogs, and replace the whole of the Long Border with sticks and twigs and pointy things that I never had to water and visitors would pass by in silent condemnation. At least a hundred crises later, pieces of ‘Mary Stoker’ were still sitting in gallon pots, waiting for the time when I made the noble gesture of giving them away, when I realized that I didn’t really want to let go of this plant. I’m tired of letting things go. For one thing, it was one of my wife’s favorite plants, like her, it was beautiful and smelled good. 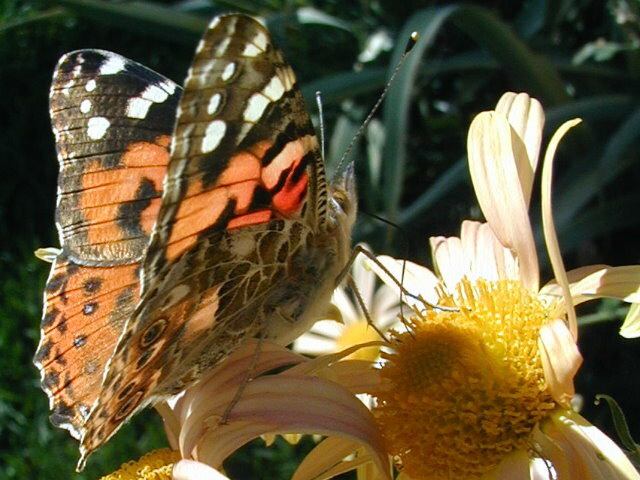 It attracted all kind of flying things, including the painted lady butterfly, Vanessa cardui. And, if you cut it back around mid-July, it would bloom profusely at just the right time of year–now. So I decided to keep it. Yes, you can give up everything you love, give up everything to which you’re attached and around which you define your life, but it’s not very much fun, and gardening, above all else, should be fun. 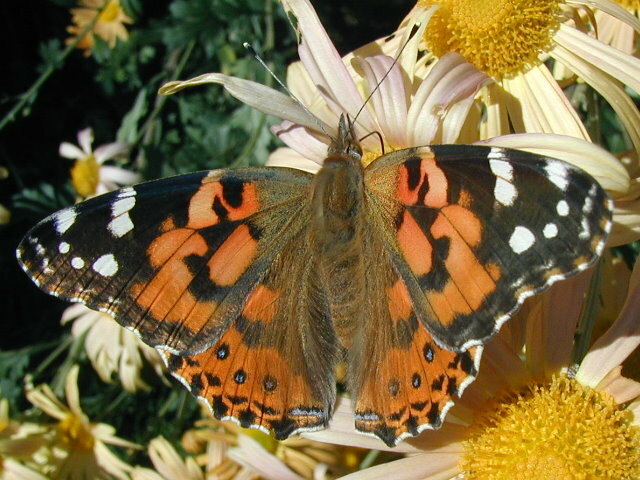 This entry was posted in Uncategorized and tagged Chrysanthemum Mary Stoker, painted lady butterfly. Bookmark the permalink. As if I would know! Well, contrary to what a lot of people seem to think, enlightenment is achieved when non-attachment is realized, so until that happens, if it ever does, I’ll cling desperately to whatever is left. Like the strawberrry everyday cake at Tony’s ….. (the blueberry is good too). What enchanting pictures! Red Admirals are among my favorite leps, for any number of reasons…and they are most fetching fetching Mary Stoker. I love chrysanthemums—even the tacky ones at grocery stores. 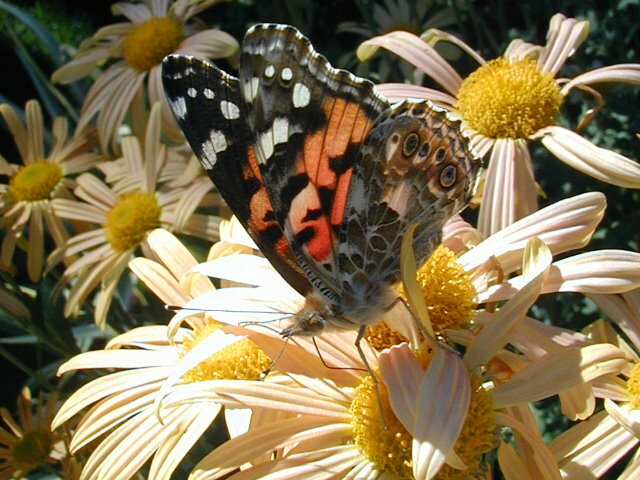 Red Admirals are related ….Vanessa atalanta, what a beautiful name. Must have something to do with apples. I like chrysanthemums too, though I think the mass-produced ones are better grown in pots. Would really like to get ‘Dr. Tom Parr’ and ‘Anastasia’ some time.